1. Are these guards compliant with the strength requirements detailed in AS1755? The ability of the guard to be unlocked for removal only through the use of a tool. The DIACON guarding system is designed using FEA and has been tested in-house to ensure that required deflection criteria are met when loads of 450N vertical and 220N horizontal are applied simultaneously to the guard, as required by Section 3.2.3 Strength, AS 1755-2000. Driven to continually improve, DIACON is closely monitoring revisions of Aust Standards to ensure that compliance is also achieved in the future. 2. What is the thermal coefficient of the plastic, with respect to expansion issues? Coeff of Exp = 0.000 059 mm/mm/C; In the heat of a 35°C day, a 1500mm long guard might reach a temperature of up to 60⁰C at the core, significantly less than a comparable steel or aluminium guard. At these temperatures, the thermal growth of a DIACON conveyor guard would be 3.1mm more than its manufactured length at a temperature of ~25⁰C., DIACON’s Conveyor Mounting Brackets are specifically designed to allow for a mounting tolerance of up to 15mm, thus negating the impact of thermal expansion on the guards. 3. What are the effects on the plastic of burning coal, gasses and the melting point of HDPE? Unlike the FRAS rated material used in DIACON Hungry Boards, the HDPE material in DIACON Conveyor Guards is not yet FRAS rated. We are currently working with suppliers to obtain such a FRAS rated, HDPE material. The HDPE material currently used by DIACON does have some self-extinguishment properties, but it will burn when a burning fuel source is present. In the event of a dramatic coal belt fire, it could be legitimately argued that the additional fuel load provided by the DIACON guarding would only amount to a few percent, when compared to the fuel load provided by the coal and the rubber belting. At present, HDPE melts at 130degC and as such, DIACON Conveyor Guards should only be used in ambient condition environments. As they are located a minimum of 150mm from the moving conveyor belt at all times, the DIACON guards never actually come into contact with the belt. 4. What are the specs on the UV Stability of HDPE? This HDPE material has an expected life of 12 to 15 years in full sunlight. Long term sunlight exposure will cause colour fading and slight chalking of the surface. The 10mm thick material will still have more than 7mm of structural strength after this time. Life exceeding 20 years is achievable with use of these guards inside CHPP plants, Conveyor Galleries, Tunnels etc due to their reduced sun exposure. Although the DIACON Conveyor Guard is a relatively new product, our sister company, Consolidated Plastics & Epoxy (CPE), has been manufacturing Pump Guards, Drive Guards etc. from this material for the past 20 years, with all guards still providing appropriate protection in compliance with Australian Standards. 5. Are there any creep issues with DIACON Conveyor Guards? HDPE does creep but by using effective engineering techniques, these effects are much reduced. Each guard is reinforced along its horizontal length with 304 S/S Angle, which is rebated into the upright 20mm thick HDPE Hook Mounting Stiffener. This rebate ensures that the load is transferred directly through the guard components without reliance on the S/S rivet fasteners. Taken together, these features minimise the effect of HDPE creep. 6. Since DIACON guards are mounted on idler frames, is there sufficient guard/support clearance to allow movement of those idler frames for belt tracking? As mentioned previously, we allow for 15mm of movement for positioning adjustments on the idler frames. We have found this to be adequate for 98% of applications. In the event of a specific problem, a special length guard would be produced to accommodate the gross variation. 7. What happens in belt weighing zones where you cannot mount your guards in the same way? In fact, we do use the same guards in belt weighing zones and while we cannot attach them directly to the belt weigh idlers, a special bracket is made to mount directly onto the conveyor stringer. The profile of the guard does not normally have to change. In those circumstances, the belt weigher is still very easy to work on during maintenance due to the easy removability of the DIACON guards. If, for example, the spacings between troughing frames in a belt weigh zone were 1000mm apart, but there were only two belt weigh idlers, we would use a 3000mm guard to straddle from one fixed troughing idler to the next. We adopt the same approach at Belt Tracking idler frames, because it is not possible to mount guards at those points either. 8. How easy are the guards to store (considering guard geometry) when performing maintenance work from a conveyor walkway? Are there any trip hazard issues? Being able to store DIACON conveyor guard on handrails during maintenance operations, is one of its most important design features. Because the diameter of the top mount bush is 44mm to accommodate the top Hook of the Guard, it can also be used to temporarily mount the guard on adjacent handrails (32nb Pipe). The upper hook is positioned to allow the Guard to hang correctly on the top handrail. As well as keeping the guard safely off the ground or walkway, this feature provides safe personnel access along the walkway as well as effective access to the conveyor during maintenance operations. 9. What life can we expect to receive from these guards? The corrosion-free properties of all materials used in the construction and fastening of our guards, mean they do not require painting or protective coating. In harsh environments therefore, DIACON Conveyor Guards will predominantly outlast steel and aluminium alternatives. The life of DIACON Conveyor Guards is effectively limited by just two things, namely the UV life of the HDPE material and the possibility of their being damaged by major impact. All guards are manufactured from robust, impact resistant materials and on most occasions will readily bounce back into shape after impact. In the event of a panel being badly damaged however, it may be replaced at minimal cost. By retaining details of every panel guard it has ever made, DIACON is able to promptly reproduce any item according to its original manufacture specifications. When quoted the appropriate Part Number (engraved on the inside of the Guard), DIACON will have a replacement guard ready for installation during the customer’s very next maintenance shutdown. In summary, DIACON guards are expected to provide 20-25 years of service under normal working conditions. 10. 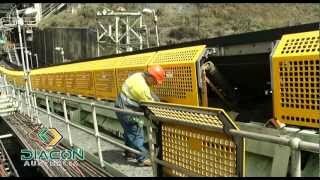 How do DIACON Conveyor Guards rate in terms of cost? Unlike earlier failed attempts to achieve cost-effectiveness in large scale plastic guard manufacture, DIACON’s innovative production process now makes plastic guarding an economically viable alternative in large scale applications such as conveyors, etc. the need for design drafting of each guard – process rationalised internally by our team. the higher than normal labour rates in Australian-made guards – reduced through manufacturing automation. the cost of modifying non-conforming or ill-fitting steel guards – allowance made in the design for simple, onsite modification. avoidance of double handling of DIACON guards during manufacture. no painting of DIACON guards during their lifetime. 11. Do you need to guard Hungry Boards or full lengths of conveyors? When DIACON Hungry Boards are installed on the conveyor’s full length for their capacity benefits. With the belt now contained under the Hungry Board’s fixed skirt, nip points are created at each troughing frame prompting the use of guards. A gallery walkway is substantially narrower than recommended by Australian Standards. The height of a catwalk in relation to troughing nip points makes the entry of limbs too easy. The frequency of use of the area is very high and the potential for harm is accordingly high. 12. 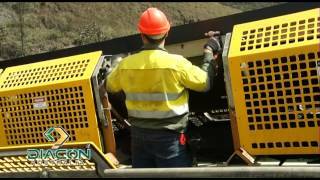 How effective are DIACON Conveyor Guard panels in terms of weight? Each DIACON Conveyor Guard is designed and produced with weight reduction in mind. The basic composition of HDPE, with its specific gravity of 998kg/m3, is up to 6.8 times lighter than steel. The strength properties of plastics relative to steel suggest a realistic weight saving of 2 to 3 times can be achieved, with good engineering design. To provide users with information needed to correctly assess if a guard can be manually handled safely in any situation, each DIACON panel is individually marked (for the life of the guard) with its actual weight, rounded up to the nearest 1kg. A typical DIACON Conveyor Guard (1500mm long) weighs 13kg, while the largest guards (3000mm long) weigh in at no more than 27kg. Every attempt is made to design panels shorter than 2000mm long to make handling guards easier, as longer guards can be difficult to manoeuvre.